I wore this last week to work actually and decided I loved it instantly. I think its the camel and the awesome blue stripes on this New Look top that really make it. I like colours that kinda shouldn't go together properly but look awesome regardless. I for one love American Apparel, Say what you want about them as a company, their adverts, their price or their ethics. But to me they have things in the colours and styles I like. Simple, clean and pretty classic. Although I think we all know some of their things are a little suspect. I bought the skirt when I was in London a few weeks back, I've been wanting it for ages in the Truffle colour, but didn't want to order online. So we made a beeline for the AA store but they didn't have my size so tried on the camel one in a small and it fit perfectly. I love corduroy, why aren't more things made of it! I really wanted a bright necklace to go with this ouftit, I've lost my got to necklace of my knotted rosary so I'm replacing that bad boy as I type! That would have been the perfect colour pop I was seeking! I've got more oversized turquoise rings up on my JWLRY site. They are the most popular at the moment so I keep trying to restock every few days! The colour of that top is stunning on you! Love the outfit! I have a soft spot for american apparel too, everything is just.. right. Shapes, colours etc. Shame about the prices though. love this look very preppy! i love those colours together, so fresh and spring like. I was just eyeing a camel corduroy skirt at Old Navy the other day, I wanted it so badly but it didn't fit. So I approve of this one! I love the way you put colors together, I'm so color illiterate, boo. very cute! that top looks like it should be in a cartoon, it doesn't look real somehow... love it xo. Love the lighting in these photos. & the colour of the skirt is perfect. This outfit is amazing! I would never of thought of putting those colours together, but they work so well! I love it. I have that skirt in the truffle colour and they sent me 2 for some reason? Very strange, I'm still trying to find out if they charged me for both! I'm loving wearing corduroy again haha. I think the last thing I wore that was corderoy was those massive flared trousers everyone used to have in about 2001! Ive just watched your New Look presenting, You did a great job. Looked like you had a amazing time. That skirt is funny, love it ! I would've never have thought of combining camel with block colours, but it looks wonderful and so eye catching.. I found that i looked all over your outfit, if that makes sense... Instead of a top immediately standing out or a skirt, the whole combination of your look is appealing. I love this. you;re right, the colours are unexpected but lovely, i love the shape of your skirt lily. Fallen a bit in love with this look. The skirt wouldn't look good on me at all but I love it anyway. The stripes on the top are so bright and different it really goes. Looking awesome as always! Jealous that you can pull that outfit off, shouldn't work but it sooo does. i love the striped top! So cool! 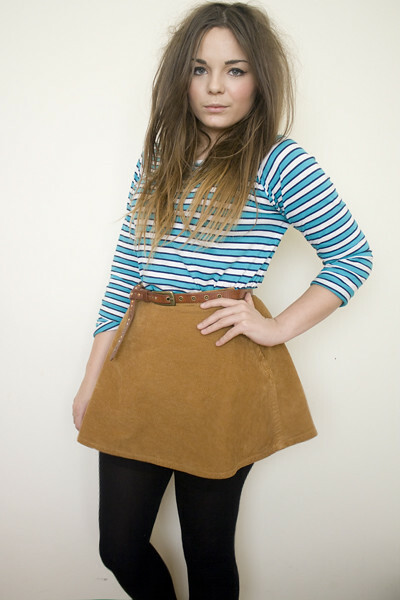 The skirt is lovely, I like the other colours it comes in too. I think you hear this all the time but you have such an amazing eye for colour! definitely one of my favourites. amazing shade of blue which i agree shouldnt go with the camel but so so does! I luv Luv LUV that skirt!!! such a good colour combo lily! I love! Love the colour pop and the rosary would have been perfect. I bet you'll find it some place really obvious or annoying one day when you've already replaced it. That sort of thing always happens to me! this reminds me of a smurf - in the most fashionable way of course. Love the bright blue contrasted with the camel. Two really nice colours. You look gorgeous :) I love this colour combo. I don't mind AA, but the store here is like super duper inflated even more than the Northern Hemisphere, so its pretty ridiculous. I love the shirt, the colour looks really nice on you! And the skirt is so lovely! Ive not seen you wear anything as bright at this top and I love it on you, looks great. That's a beautiful skirt from AA, and it actually goes real nice with the blue of the top. Charming look! i love that skirt! if only i can afford to get american apparrel items! ahaha! That turquoise in the top is really striking! It's funny how well the colours go together, if someone told me turq and camel I'd probably turn my nose up at it, but they look fab. Even better that it's corduroy, love me a bit cord! I love american apparel, have for years. 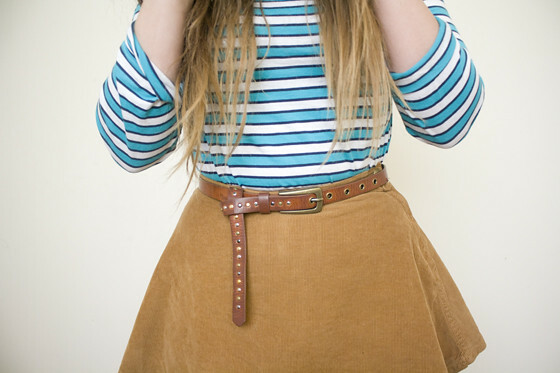 I love that skirt as well I own the camel and truffle colours. It looks great with blue! Lily.. you look beautiful, love how you put the whole outfit together. Cute skirt. I love the top on you. You should wear it more often. You look great. the colors look beautiful together! The shirt is too cute, love the turqoise! I cannot wait to go to New York at the end of the month and spend all my spending money in American Apparel! Their stuff is just so simple but great. This is really lovely, no one around where I live wears clothes like these.